The core technology of laser therapy is typically based on a defined dosage of light energy applied to the damaged area but over the years more and more manufacturers say that pulsing is key to success. 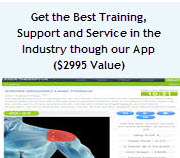 This article analyzes the market so see if there are any trends or agreement on the use of pulsing in laser therapy and we will review some of the most popular pulsing frequencies. Then we wrap up with some recommendations. The core of photobiomodulation is based on delivering a specific dosage that historically was done using continuous wave (CW) laser and CW produces the shorter treatment times. Then the concept of pulsing the laser was developed because it allowed the laser to stay cooler (because the laser is off part of the time) and the treatment is safer because there is less potential for eye damage. As research was done, we have learned that pulsing has other advantages. Some pulsing frequencies stimulate other systems in the body. Another concept around pulsing is that the human body is adaptive. If you push on one spot long enough, eventually the body adapts and you don't react to that pressure (like wearing clothes). A similar thing can happen with a continuous wave lasers and long term therapies. By pulsing the laser, it is harder for the body to adapt and stop reacting so pulsing can be the superior options in many long term treatment plans. This is less of an issue for acute problems that will be resolved in just a few treatments and for many practitioners, it is just faster and simpler to use a CW laser. If it is within your budget, the best option is to have both pulsing and continuous wave. This gives you maximum flexibility. There are some manufacturer like Apollo and the LZR7 that build Continuous Wave only lasers that do not allow pulsing. In videos and books from Dr Curtis Turchin ( the inventor of the Apollo laser), he says that we really have no idea what the best pulsing frequency is and we just waste time tweaking a laser with complex pulsing setups when there is not way to know what the best pulsing frequency is anyway. It seems that he is right about not knowing the best pulsing but it seems in many cases any pulsing is better than no pulsing. On the flip side, there are companies that build pulsing only lasers like, Erchonia, TheraLase and TerraQuant. Originally, pulsing was used to extend the life of the laser diodes by keeping them cooler (because they are off part of the time) but then we started to see some positive evidence from companies like Erchonia and MultiRadiance that show great results with very low dosages and a strong emphasis on pulsing. Now we have some significant research showing the advantages of pulsing in therapy. Super-Pulsing is used by TerraQuant, MR4, Theralase, Lumix and K-Laser. In super-pulsing, a higher power laser is pulsed at a very low duty cycle. This give these system the advantage of a high peak power but they are super safe because they do not generate any significant heat. In general, pulsing is a double edged sword. Any time the laser is pulsing, it is off some of the time and that decreases the dosage and extends the treatment time. The ratio between the on time and off time is called the duty-cycle. Some manufacturers are tricky because they use very low duty-cycles to allow them to use really cheap diodes and very little or no cooling of the diodes. Higher-end system that allow or include high-duty cycle pulsing. Although a study from Dr. Morries (see below) showed that high duty-cycle pulsing counter intuitively increased the amount of energy that reach a light meter buried deep inside a test sample, many systems use super low duty cycles so that they can sell higher power systems built with cheap materials. Apollo lasers are made by Pivotal Health System and were original developed by Curtis Turchin. He wrote several great books that include protocols for treating a variety of conditions. Apollo lasers are some of the original lasers on the market and they are continuous wave only lasers. Their theory is that no one knows what the right pulsing frequency is so why make the laser more complicated. We still often recommend Apollo system for practitioners who don’t plan on trying to tweak the laser much and they just want fast and easy results. Their systems are always pulsing at a fixed pulsing frequency. Their systems have a fixed pulsing frequency of 2112 Hz. All the original ML830 systems were continuous wave only. Their newer "smart laser" adds pulsing but they do not publish any info about the pulsing frequencies. We believe that Multiradiance is the largest therapy manufacturer of lasers in the world and they manufacture both TerraQuant and MR4 lasers. Their core technology is based on super-pulsing technology which uses a high peak-power laser with a very low duty-cycle (off more than it is on) so their technology is more about the pulsing than delivering dosage like most core therapy laser companies. Their protocols do not even specify dosage, just pulsing frequency and treatment time. Every system includes 12 protocols. Of these protocols, most recommend pulsing at 50 Hz, then variable (1000-3000Hz) and then 1000 Hz on some select protocols. Their theory is that 50 Hz is stimulatory while 1000 Hz and the variable setting are inhibitory. Inhibitory is good for pain reduction but stimulator is better for stimulating cellular changes. They also recommend 250 Hz for most conditions but their more basic lasers don’t have that as an option. Erchonia and Dr Rarucha are the leaders in the development of pulsing frequencies but their system is designed around the Erchonia lasers. Rarucha sells his own protocol manual for the Erchonia products. Here are some sample of a typical treatment pulsing frequencies for an Erchonia lasers. Rarucha’s publications are like a bible for pulsing frequencies sent straight from a higher power but it seems almost impossible to scientifically develop such precise pulsing frequencies for so many different conditions (over 50) without spending tens of thousands of hours testing a huge volume of patients. In general, a majority of pulsing recommendation are less than 160 Hz for most problems and higher frequencies are used more for non-structural issues. Â Since Erchonia lasers use 4 frequencies and only red laser light at extremely low dosages, they are really on the fringe of the overall laser market. Avant has over 80 presets for pulsing. Many of them are sweep through a range of pulsing frequencies. This reduces the need to try an pick one perfect pulsing frequency. This is the state-of-the-art until we get more conclusive pulsing feedback. Most of them are under 100Hz with 15Hz being one of the most popular. Thor is one of the most respected laser companies because they put more effort into their research and protocols than any other company. All their protocols recommend 2.5Hz for pulsing for stimulation and continuous wave for inhibition. Because their equipment only allows for about 12 pulsing frequencies, they are limited to one of the preset frequencies so 2.5 might not the ultimate, it is just the best option from their limited choices. Thor lasers are also one of the oldest designs on the market and they have not done any changes to their product in many years. Their equipment has been used in many successful studies and they have a pretty cool protocol library. 3B Scientific specializes in acupuncture lasers. They sell several systems that are made in Europe by some of the leading laser manufacturers who don’t really sell laser for treating humans in the US like MKW. Their laserPen is totally programmable from 0.1 to 10,000 Hz, and has presets for Nogier, Bahr, Reininger, Chakra frequencies ( 7th Chakra Sahasrar - 172.06 Hz, 6th Chakra Ajna - 221.23 Hz, 5th Chakra Vishudda -141.27 Hz, 4th Chakra Anahata - 136.10 Hz, 3rd Chakra Manipura - 126.22 Hz, 2nd Chakra vadisthana - 210.42 Hz, 1st Chakra Muladhara - 194.18 Hz) Chakras are also used in Yoga to control the body. 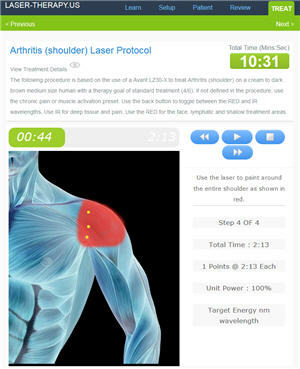 RJ is a German company that focuses more on acupuncture type lasers. Their system includes Bahr, Nogier and Reninger frequencies. The Pilot Laser is a class 4 system that both continuous wave and pulsing but it only has one pulsing frequency of 10 Hz with a 50% duty cycle. Both the Aspen and Nexus lasers offer total control of the pulsing frequency and the duty cycle. This high-end class 4 systems do everything well but they are more expensive than a class 3b system. The internal protocols on these systems use mostly CW to maximize the dosage. At a nearby clinic, they typically use 10 444Hz with a 70 to 90% duty cycle. Lumix systems are unique in the fact that they combine a super-pulsing 910nm laser with a CW 810nm. This is the best of both worlds. They offer programmable pulsing frequencies up to 100,000Hz. Their dual wavelength systems are class 4 lasers. K-laser systems are both CW and pulsing but most of their internal protocols are using pulsing to keep the heat down. Their package size is about Â¼ of the size of a comparable powered laser so they must do something to keep the heat level down. Their systems are programmable up to 20,000 Hz. LiteCure products offer both pulsing and continuous. The pulsing frequency is totally programmable. Using the research tool at laser-therapy.us, we have searched for some of the more conclusive studies that analyzed the use of different pulsing frequencies. In a study by Farouk Al-Watban, thier study showed that 100Hz pulsing was the best frequency for wound healing when compared to 100, 200, 300, 400 and 500Hz using a 635nm Erchonia laser. The Comparison of Effects between Pulsing and CW Lasers On Wound Healing This study was supported by Erchonia which also promotes the use of laser through clothing so take it with a grain of salt. Effect of pulsing in low-level light therapy is the most definitive study of the effects of pulsing on lasers. Their results do not show a conclusive result about the best pulsing frequency but they reference several key studies including one about using laser to treat the brain. They found that pulsing was far superior to CW. Is a study on rabbit brains, they found that CW radiation managed to raise the cortical ATP levels by 41%, whereas PW administration raised these levels by over 150%? “There has been remarkably little information available in the peer-reviewed literature on the rationale for using pulsed lasers or pulsed light in LLLT rather than CW. Moreover, there is no consensus on the effects of different frequencies and pulse parameters on the physiology and therapeutic response of the various disease states that are often treated with laser therapy. This has allowed manufacturers to claim advantages of pulsing without hard evidence to back up their claims. Dr Hamblin, one of the most respected phototherpy experts has expressed his opinion that 10Hz is the best pulsing frequency for any brain related therapies. The range is from 10Hz to 40Hz and he says that higher frequency might be too fast for the brain to react to the pulsing information. In many of non-laser forms of healing, pulsing frequencies are integral to the practice. One of the most common is the use of spoken frequencies like the "Om" in yoga to send message to the body. The following is a summary of some of the more popular frequencies. Nogier frequencies are one of the most recommended pulsing frequencies for working with healers. Here is a summary of the theory of why each pulsing frequency is special. Some of the descriptions below include applications that are not FDA cleared. The A frequency is generally used on wounds and other maladies close to the surface of the flesh. The reason for this is that the A frequency resonates with the ectodermal tissues (the outermost layer of cells or tissue of an embryo in early development, or the parts derived from this, which include the epidermis and nerve tissue.) This is viewed as a universal frequency that can be used for almost any condition. The B frequency is used for more internal problems like lung, liver, or gastrointestinal tract issues. This is because it resonates with tissue that originates from the endoderm (the innermost layer of cells or tissue of an embryo in early development, or the parts derived from this, which include the lining of the gut and associated structures.) It’s thought to improve allergy problems, nutritional assimilation, and balance the parasympathetic nervous system. The C frequency is meant to be used on tissue that originates from the mesoderm (the middle layer of an embryo in early development, or parts deriving from this, which include bones, muscles, tendons, and the circulatory system) This frequency is useful in treating joints, and anything causing mobility problems. The D frequency is primarily used to help with coordination, it does this by helping to bring the two sides of the brain to balance. This frequency is also used to reduce stress, and helps to organize thoughts. The E frequency is used primarily for pain control. This frequency resonates with the nervous system, and is less likely to heal tissue, but is thought to help with pain. The F frequency is usually used on chronic conditions, such as non-healing skeletal fractures. It resonates with the subcortical brain regions, and can be used for things like depression, headaches, and muscle spasms. This frequency is also frequently used for acupoints and trigger points. The G frequency is another universal frequency like the A frequency. This frequency resonates with the cerebral cortex, and is used to reduce inflammation. It can also be used for anxiety, stimulating creativity, helping memory, and psychological disorders. This frequency can be used for almost any problem, since it can reduce inflammation. In conclusion, there is no consistency between manufacturers on the best pulsing frequency for any specific condition.Â The most commonly recommended preset pulsing frequencies include 2.5Hz, 10,Hz, 100Hz and 250Hz based on the manufacturers and several studies. One of the most common European pulsing frequencies is Nogier A at 292 Hz. Dr. Hamblin recommends 10Hz for many applications. There is evidence that pulsing is superior to CW for most application except nerve regeneration. For practitioners that already have training in the use of different pulsing frequency, a high duty-cycle programmable pulsing laser allow the practition to deliver both pulsing and dosage and have total control over the pulsing portion of the healing process. If you don't have an opinion about specific pulsing frequenceis, then a don't spend too much time trying to find the perfect pulsing frequency and just use a general pulsing frequency in the 2.5 to 292 Hz. When shopping for lasers, it is always best to buy a system that does both pulsing and continuous wave if it is within your budget and then use the pulsing for most applications. If you have any questions or need advice on selecting the best laser, please call us at 800-388-0850.